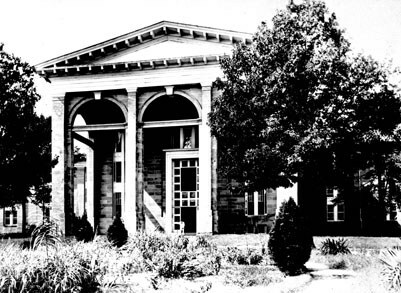 On December 23, 1848, the General Assembly approved the construction of an “Insane Hospital of North Carolina.” The approval was the result of intense lobbying by Dorothea Dix, noted advocate for the mentally ill.
A 182-acre site was chosen in southwest Raleigh, and in 1853, Dr. Edmund Strudwick of Hillsborough became the first physician and superintendent of the facility. Construction was not completed until 1856. The building’s first two wings accommodated 274 patients. The hospital was renamed “Dix Hill” after Dorothea Dix’s grandfather, Dr. Elijah Dix, because Dix refused to accept the honor. The first patient arrived at Dix Hill in February 1856, and was diagnosed with “suicidal mania.” By the beginning of the Civil War in 1861, Dix Hill had 193 patients on the premises. In April 1865, Union troops camped on the grounds. By the early 1900s, the public had begun to accept mental illness as a disease and pressured the state legislature to increase the capacity of all hospitals within the state. As a result two branch facilities were opened in Morganton and Goldsboro. In August 2012, the hospital, then called Dorothea Dix Hospital, moved its last patients to Central Regional Hospital in Granville County.